A festive journey destined to delight travellers of all ages. Switzerland, France and Germany provide the perfect backdrop for this true connoisseur’s Christmas market cruise. Discover the roots of our Christmas traditions as you explore some of Europe’s most charming towns. Savor tantalizing once-a-year treats with Uniworld’s “Taste of Christmas” programme, including gingerbread, crepes with cinnamon and warm spiced wine. Arrive at Euro Airport Basel-Mulhouse-Freiburg, where you will be transferred to the ship. FEATURED EXCURSIONS: Basel walking discovery tour with Christmas Market. Basel is a cultural and artistic powerhouse, with all sorts of galleries, theaters and museums. And at this time of year, the city’s Christmas market draws visitors from all over Europe, as does its Christmas Street, lined with more than 100 beautifully decorated and illuminated Christmas trees. Be sure to make a wish in the town’s Wish Book! Your day in Basel begins with a short panoramic tour of Switzerland’s second-largest city. Long an important center of education, banking and trade, Basel boasts a glorious history that stretches back to the Roman Empire. During the Renaissance, its university and master printers drew intellectuals from all over Europe, including the great thinker Erasmus of Rotterdam, whose tomb is found within the walls of the Romanesque cathedral. To this day, the city remains a cultural and artistic powerhouse, with numerous art galleries, theaters and more than 30 museums. And at this time of year, a beloved Christmas market draws visitors from all over Europe. A special Captain’s Welcome Reception and Dinner will be prepared for you this evening. FEATURED EXCURSIONS: Choice of Strasbourg by canal with Christmas Market OR exclusive "Taste of Christmas" walking discovery tour. Strasbourg is invariably described as quaint, a rather overused word that in this case is perfectly apropos. Whether you see it via a canal boat or on foot with a friendly local expert, this historic town with its cobbled lanes, half-timbered homes, giant stork nests and impossible-to-resist pastry shops will win your heart. 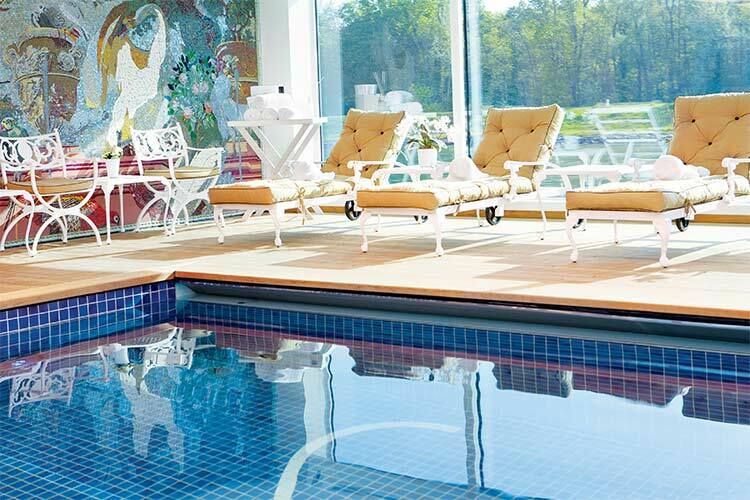 Kehl, directly across the river from Strasbourg, will be your ship’s base while you explore the Alsatian capital, which is known as the “Crossroads of Europe” for its strategic location halfway between Paris and Prague. It is home to a magnificent, single-spire Gothic cathedral and many beautiful half-timbered houses." FEATURED EXCURSIONS: Choice of full day Heidelberg tour with Christmas Market* OR exclusive Doktorenhof vinegar estate visit and tasting. Wake up in Germany and choose your adventure for the day. You can join an excursion to the historic university town of Heidelberg, where you’ll see the castle ruins and visit the Christmas market. Or for something really unexpected, venture into a spooky, candlelit tasting room to sample flavorful elixirs made from wine vinegars. Utterly unique and surprisingly delicious! Your ship left France behind and sailed into Germany during the wee hours of the morning. If you speak no German, here’s one phrase you might want to learn now: “Fröhliche Weihnachten,” or “Merry Christmas!” Today you’ll have two choices: Venture into the storied city of Heidelberg, home to the oldest university in the country, or visit the Doktorenhof vinegar estate for a special vinegar tasting. FEATURED EXCURSIONS: Siegfried's Mechanical Musical Instrument Museum with Christmas Market. Double your fun today with visits to two Christmas markets. The first is in Mainz, the birthplace of Gutenberg’s revolutionary printing press and home to a 200-year-old Christmas market. The next is in Rüdesheim, a town famous for its life-sized Nativity scene, brandy-infused coffee and a quirky museum devoted to mechanical musical instruments. Mainz, standing at the confluence of the Rhine and the Main rivers, may be best known as the city where Johannes Gutenberg prepared his priceless 42-line bible for publication in 1485, using his newly invented printing press. You have the morning at leisure to explore the city that inspired such ingenuity, venturing off on your own to visit the Gutenberg Museum or one of the other intriguing museums nearby. Or you could stroll with the Cruise Manager through the Old Town neighborhood known as the Cherry Orchard, which is lined with picturesque half-timbered houses, on your way to the 200-year-old St. Nicholas Christmas Market. The millennium-old St. Martin’s Cathedral acts as its backdrop, and the holiday pyramid smack in the middle of the square reflects Mainz’s history— figures of Gutenberg and the ancient Roman commander Dresus join the standard angels and Santas. Mainz’s Old Town brims with specialty shops tucked into lovingly restored buildings: You’ll find jewelry, leather goods, books, toys—something special for every special person on your list. However you choose to spend your time in Mainz, you’ll head back to the ship for a short cruise to Rüdesheim, which, like many cities along the Rhine, dates back to Roman times, when the Rhine was the northern border of the empire. Today, Rüdesheim is famous for its beauty and its entertaining alley of shops and wine bars called the Drosselgasse. It’s also home to a unique and fascinating little museum devoted to mechanical musical instruments. FEATURED EXCURSIONS: Koblenz walking discovery tour with Christmas Market. On today’s cruise along the Rhine, watch out for the Loreley rock, a tall slate cliff towering over the narrowest point of the river. Celebrated in song and shrouded in legend, the rock is famous for the tale of Loreley, a beautiful siren whose beguiling song doomed passing sailors. Further down the river, step ashore in Koblenz, a historic town with a colorful past, eclectic architecture and an enchanting Christmas market. Spend a spectacular morning onboard your luxurious boutique ship as you sail the Upper Middle Rhine Valley. A UNESCO World Heritage Site, this stretch of the Rhine is extraordinarily picturesque: Castles perch atop steep cliffs above the water and each quaint village is marked by the spire of its historic church. The ship will pass the famous Lorelei rock, where, legend has it, a siren lured sailors to their doom. After sailing past 40 miles (65 kilometers) of gorgeous scenery, you’ll reach the famous intersection of the Rhine and the Moselle. Here, where the two rivers meet, you’ll find the enchanting town of Koblenz. 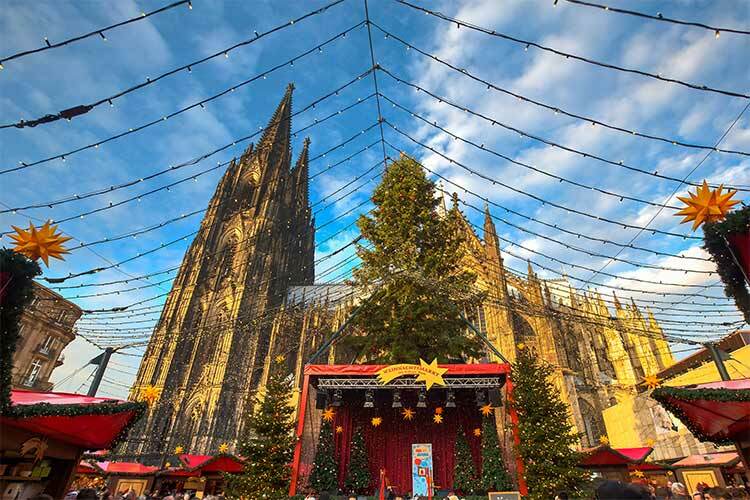 FEATURED EXCURSIONS: Cologne walking discovery tour with Cologne Cathedral visit and Christmas markets. You simply cannot visit Cologne without paying homage to its most notorious site, the Gothic masterpiece that serves as the city’s cathedral. Your local expert will show you favorite haunts around the Old Town and share some of the cathedral’s most intriguing and Magi-cal secrets with you. Later, you can explore the city’s seven (!) Christmas markets to your heart’s content. Cologne is the largest and oldest city of the Rhineland and a cultural mecca, with more than 30 museums and hundreds of art galleries. A congenial atmosphere and a mix of ancient, modern and reconstructed buildings characterize the heart of the city. A special Captain’s Farewell Reception and Dinner will be prepared for you this evening. Disembark the ship and transfer to Cologne Bonn Airport for your flight home. Cultural enrichment, including a Signature Lecture: "European Christmas Traditions, from the Nutcracker to the Tannenbaum"